It is a Bollywood remake of Murugadoss's own 2005 Tamil film of the same name, which in turn was inspired by the film Memento (2000). Ghajini follows the story of a businessman who develops anterograde amnesia following a violent encounter in which his love interest, a model named Kalpana, was killed. He tries to avenge the killing with the aid of photographs from a Polaroid Instant camera and permanent tattoos on his body. It largely follows the same plot as the Tamil original, but with an altered climax rewritten by Aamir Khan. Ghajini became the highest-grossing Indian film of 2008, and the first Indian film to cross the ₹100 crore mark domestically, creating the 100 Crore Club. Ghajini's paid preview collections were ₹27 million. On release, it became the highest-grossing Indian film of all time, until it was surpassed by another Aamir Khan movie, 3 Idiots (2009), the following year. Aamir Khan's character was featured in a 3D video game titled Ghajini – The Game, which is based on the film. Sunita (Jiah Khan) is a medical student working on a project about the human brain with her classmates. When she was denied access by her professor to the curious case of Sanjay Singhania (Aamir Khan), a man reported to have anterograde amnesia, because it is under criminal investigation, Sunita decides to investigate the matter herself. It is later revealed that Sanjay loses his memory every 15 minutes. He uses a system of photographs, notes, and tattoos on his body to recover his memory after each cycle to remind himself of his mission: to avenge the death of his girlfriend Kalpana (Asin). He systematically kills the people who were involved in the murder. His main target is Ghajini Dharmatma (Pradeep Rawat), a notable social personality in the city, and the man directly responsible for Kalpana's death and Sanjay's condition. Police inspector Arjun Yadav (Riyaz Khan) tracks Sanjay down to his apartment and knocks him unconscious. Yadav finds two diaries in which Sanjay has chronicled the events of 2005 and 2006. The film flashes back to 2005 as Yadav reads the diary. Sanjay Singhania is the chairman of the Air Voice mobile telephone company. In the course of business, he sends his men to meet Kalpana, a struggling model of Mumbai, about putting up a billboard above her apartment. The owner of Kalpana's advertising firm misinterprets this as a romantic advance and, in view of a possible lucrative Air Voice ad campaign, encourages Kalpana to accept the overture. Kalpana thinks of it as an innocent prank that may fetch her better modelling work and decides to act as Sanjay's girlfriend. Sanjay goes to confront Kalpana about this but falls in love with her at first sight. He hides his identity and introduces himself as Sachin, and the two begin spending time together. The diary ends with Sanjay proposing to Kalpana and promising himself that he will reveal his actual identity if she accepts. When Yadav is about to read the 2006 diary, Sanjay awakes and attacks him, tying him up. Ghajini realizes that someone is trying to kill him but is unable to figure out who. Sunita visits Sanjay's flat and discovers Sanjay's plan to kill Ghajini. She takes both his diaries before finding Yadav, beaten and bound, and freeing him. Just then, Sanjay arrives, he remembers neither of them and chases them out. Yadav is hit by a bus as he flees in terror, and Sunita, believing Ghajini is the good guy in danger, informs him about Sanjay. 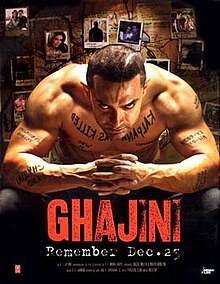 Ghajini arrives at Sanjay's flat and destroys all of Sanjay's photographs and notes, as well as the tattoos on Sanjay's body, so that Sanjay is left with nothing to help him recover his memory. Meanwhile, Sanjay discovers that Sunita had warned Ghajini and he goes to her dormitory to kill her, but Sunita calls the police and Sanjay is arrested. Back in her dormitory as Sunita reads the diaries, the film flashes back to 2006, where it is revealed that Kalpana had accepted Sanjay's proposal. When this diary ends abruptly, Sunita investigates further and discovers that Kalpana was travelling to Goa for a modelling assignment when she came upon 25 innocent young girls being trafficked. She had saved the girls with the help of some army soldiers on board, who named Ghajini as the ringleader of the racket. Outraged, Ghajini broke into Kalpana's apartment with his goons to kill her. When Sanjay arrived, he found Kalpana stabbed. Ghajini then hit Sanjay over the head with an iron rod. Sanjay's last sight was Ghajini brutally murdering Kalpana with the iron rod. Kalpana's last word to Sanjay was "Ghajini." Sunita, now aware of the shocking truth, finds Sanjay in the hospital and tells him the truth. He flies into a heartbroken rage and tracks down Ghajini with Sunita's help. He fights off all of Ghajini's henchmen with a superior and anger-fueled strength. Ghajini, upon realizing Sanjay is too strong for him, flees. Sanjay's memory loss strikes again, and he forgets who Ghajini is. Ghajini takes this opportunity to stab Sanjay and taunt him with the grisly tale of how he murdered Kalpana. As he is about to make Sanjay relive the experience by killing Sunita in the same exact way, Sanjay recovers the memory of Kalpana's murder, and overpowers Ghajini in a flash of strength. He finally kills Ghajini, in the same way Ghajini had killed Kalpana. The film ends 6 months later, with a still-amnesiac Sanjay who is once again the Chairman of AirVoice and is volunteering at an orphanage named after Kalpana. Sunita gives him a gift that reminds him of his bond, with Kalpana, and Sanjay sees Kalpana by his side. Sanjay is finally at peace with himself. Pradeep Rawat as Ghajini Dharmatma, a gang honcho and the mastermind of many illegal and criminal ventures. Riyaz Khan as Inspector Arjun. A police inspector who is investigating the murders by Sanjay Singhania. It was rumoured earlier that the film was titled Kajri. It is a remake of the Tamil film, Ghajini (2005). Aamir Khan, who had never before made a remake film in his career, was initially hesitant to do the film, but was convinced by Suriya, the original star of the Tamil Ghajini, who told him he was "the only one who could do justice to the character." Suriya was a fan of Khan, and had some involvement in the film's development, discussing minute details with Khan for two years during the film's development. Priyanka Chopra was offered the lead female role in the film. However she turned down the part because of scheduling conflict. We didn't make too many changes in the rest of the film. Every time I'd suggest a change in Ghajini from the original, Aamir would firmly cut it down, saying we should stick to the Tamil script. But he decided we should rewrite the climax. The entire location, incidents and dialogues for the climax were re-written by Aamir. I think the Hindi version is far better than the Tamil Ghajini because of the changes Aamir made. Murdagoss's original 2005 Tamil version of Ghajini was inspired by the American film Memento (2000), which itself was adapted from the short story Memento Mori. The film stars Guy Pearce as Leonard Shelby, a former insurance fraud investigator searching for the man he believes raped and killed his wife during a burglary. Leonard suffers from anterograde amnesia, which he contracted from severe head trauma during the attack on his wife. Certain concepts like writing notes behind instant Polaroid photographs and tattooing facts on his body are also similar. According to Aamir Khan, "Ghajini is not a remake or even slightly inspired by Memento, but it's a remake of the Tamil film, Ghajini". However, he acknowledged that Murgadoss's original Tamil film was at least partly inspired by Memento, stating, "Murgadoss had heard about a film called Memento and the concept had really fascinated him. Without having seen the film he went ahead and wrote his own version of the script and screenplay. Having finished his script, he then saw Memento, found it very different from what he had written, and went ahead and made Ghajini." Christopher Nolan was later made aware that an Indian film with a plot similar to Memento was released. As said by Anil Kapoor in an interview, when he met Nolan, he said Nolan was "upset" about the film and Nolan said that he was neither credited nor compensated. The film's title is a reference to Mahmud of Ghazni, the tenth-century Sultan of Ghaznavid Empire whose name is pronounced "Ghajini" in Tamil. Several comical scenes in the film are similar to Happy Go Lovely (1951). The scene where Kalpana (Asin Thottumkal) helps a blind man to cross the road is similar to the French film Amélie.. The CGI opening brain sequence was a direct inspiration from the opening sequence from the 1999 David Fincher film, Fight Club. The film's title sequence is a visual effects composition that depicts the inside of the brain at a microscopic level; the camera pulls back to the outside, starting from a neuron. Shooting started in Chennai in May 2007. Climax was shot in Old City, Hyderabad. Other filming locations included Bangalore, Cape Town, Deadpan Desert and Mumbai. Aamir Khan had spent a year working out at the gym, training for his role. This film marked the Bollywood debut for Asin. The film's production budget was ₹65 crore (equivalent to ₹135 crore or US$19 million in 2018). Ghajini (main villains named film) was released on 25 December 2008 with an estimated 1,500 prints worldwide, including 1,200 prints (digital and analogue versions) in the domestic market, making it the largest Bollywood release at that time. The domestic rights were sold to Geetha Arts for ₹530 million, while satellite, overseas and home media rights were sold at a total of ₹400 million, breaking the records of Shah Rukh Khan's film Om Shanti Om's ₹730 million. The overseas distributors, Reliance Entertainment released the film with 300 prints in 22 countries, including 112 prints in the US and Canada, 65 prints in the UK and 36 prints in the UAE. Ghajini was also released in Norway, Germany, Denmark, Netherlands, Belgium, South Africa, Australia, New Zealand, Hong Kong and Singapore. It had around 650 paid previews which fetched it around ₹70 million. It is 25 December 2018 and the film is a decade old. It marks the day of release of the film and analysis of the marketing strategy used to promote the film. The two-disc collector's edition DVD was manufactured by Big Home Video and distributed by international distributor, Adlabs Films Ltd on 13 March 2009 with a MSRP of US$19.99. It received a 15+ age rating by the British Board of Film Classification for persistent and excessive violence. Ghajini reportedly earned ₹40 million from gaming rights (a first for a Bollywood film), ₹210 million for satellite rights for India and overseas, and something to the tune of ₹100 million for home video and music. A PC video game based on the film was manufactured and produced by FXLabs Studios Pvt Ltd and Geetha Arts, and marketed and distributed by Eros Home Entertainment: Ghajini – The Game. It is a third-person action game consisting of five levels of play; here the player controlled the protagonist Sanjay to accomplish missions using martial arts, weapons, and artefacts. It was hailed as India's first true 3D PC game with an MSRP of US$14.99. Although never officially rated, the distributor recommends that 15+ year old players partake in the game. Director A. R. Murugadoss was arrested shortly before the film's completion. According to Salem Chandrasekhar (producer of the Tamil original which is a loose knockoff of a Hollywood movie Memento), he had not bought the rights to remake the film in Hindi. Sonia Chopra of Sify gave the movie 3.5 stars and recommended watching it "For the four As—Aamir, Asin, AR Murgadoss and AR Rahman". Rajeev Masand of CNN IBN gave 3 stars writing, "Ghajini isn't a particularly good film, but entertainment it delivers by the bucketful." Martin D'Souza of Bollywood Trade News Network gave 3.5 stars, noting the flaws in screenplay, while praising the action. Taran Adarsh of Bollywood Hungama remarked that the movie "is a winner all the way" and gave it 4.5 stars. Nikhat Kazmi of The Times of India praised the performance by Aamir Khan as its high point and awarded 3.5 stars. Zee News described Aamir's performance as his best till date. Sukanya Verma of Rediff gave the movie 3.5 stars, while describing the film as "a sleek album of dark memories, which are terrifying to relive and shattering to experience". Noyon Jyoti Parasara of AOL India said, "Most comparisons often point out that a remake is not as worthy.Ghajini however succeeds when it is compared to the Tamil version directed by the same director." Anupama Chopra of NDTV said "Ghajini isn't a great film or even a very good one but I recommend that you see it. It is, as we used to say in the old days, paisa vasool. Kaveree Bamzai of India Today said that "This is brutality, choreographed by a poet, and therefore that much more compelling." giving it 3.5 stars. The film received some mixed and negative reviews. Gaurav Malani of Indiatimes gave 2 stars, criticising its length while praising the performance of the cast. Raja Sen of Rediff rated the movie 2.5/5 and criticised the performance of Asin while concluding, "overwhelming feeling is one of regret". Shubhra Gupta of Express India concluded that Ghajini is too long, too violent, and criticised Jiah Khan's acting and dancing skills, but praised the performances of Aamir Khan and Asin. Hindustan Times gave it 2 stars and said "You'd like to give Ghajini a long-term memory loss. Kya, kyon, kahan? Murugadoss.? Aamir? Asin? Who? Got to jog my memory... maybe after 15 minutes." Ghajini grossed ₹110 crore in five days. A success party was organised at Taj Land's End hotel in Mumbai on 30 December 2008 to celebrate this feat. Trade analyst Komal Nahta estimated the film's first week nett collections to be ₹62 crore. Ghajini grossed ₹232 crore (equivalent to ₹483 crore or US$67 million in 2018) in two weeks—including a domestic gross of ₹162 crore (equivalent to ₹338 crore or US$47 million in 2018) and an overseas collection of ₹70 crore (equivalent to ₹146 crore or US$20 million in 2018). A success party was organised to celebrate its ₹200 crore worldwide celebration in January 2009. By that time, the film had also nett ₹104.31 crore domestically, making it the first Indian film to nett over ₹100 crore domestically, creating the 100 Crore Club. Ghajini became the highest-grossing Indian film ever at the time, and was declared an "All Time Blockbuster". Its record was eventually surpassed a year later by another Aamir Khan film, 3 Idiots (2009). The film has six songs, including two remixes, composed by A. R. Rahman and with lyrics penned by Prasoon Joshi. Bollywood Hungama wrote, "The music of Ghajini is all set to make waves way into 2009 after the Christmas release of the film. When 'best of the best' list would be compiled at the year end, it would be hard to ignore Ghajini. "Rediff.com gave it the highest possible rating of five stars with the reviewer praising Rahman saying, "This could just be one of his finest albums ever. Not just are the tracks great, but each one segues into the next with perfect unpredictability." According to the Indian trade website Box Office India, the soundtrack album sold about 1.9 million units, making it the year's best selling Bollywood music soundtrack album. ^ a b c d "'Aamir Khan rewrote Ghajini climax'". Hindustan Times. 31 December 2008. ^ "GHAJINI - British Board of Film Classification". Retrieved 6 February 2017. ^ a b "10 Of The Most Expensive Bollywood Films Ever Made". India Times. 17 April 2015. ^ a b c d Meena Iyer (8 January 2009). "'Ghajini' first Hindi movie to cross Rs200cr mark". TimesOfIndia. TNN. Retrieved 12 January 2009. ^ a b c "Ghajini collection details submitted to court". The Hindu. 28 January 2009. ^ "Aamir Khan's Ghajini revealed". Bollywood Hungama. 13 September 2007. Archived from the original on 21 September 2011. Retrieved 24 August 2010. ^ "Aamir's Ghajini is no Memento remake?". India Times. Archived from the original on 14 July 2012. Retrieved 24 August 2010. ^ "Aamir inspired by Jason Statham?". India Times. Archived from the original on 12 July 2012. Retrieved 24 August 2010. ^ "'3 Idiots' surpasses Aamir's last release 'Ghajini'". The Hindu. Chennai, India. 29 December 2009. ^ "The Ghajini Video Game Arrives!". India.com. 22 December 2008. Archived from the original on 1 February 2009. ^ Faridoon Shahryar (21 November 2006). "Aamir Wants Asin in Ghajini Remake". IndiaGlitz. ^ a b c "Exclusive: Suriya on Aamir's Ghajini". Rediff. 29 December 2008. ^ "Surya convinced me to do Ghajini: Aamir Khan". Sify. December 2008. ^ "Aamir, "Ghajini is not a remake... "". One India. Archived from the original on 18 February 2013. Retrieved 24 August 2010. ^ Aamir Khan (29 June 2007). "Ghajini". The Lagaan Blog. Archived from the original on 8 August 2007. Retrieved 2 March 2009. ^ "Watch Anil Kapoor's Hollywood journey". YouTube. Retrieved 9 January 2013. ^ Raveh, Daniel (2016). Sutras, Stories and Yoga Philosophy: Narrative and Transfiguration. ISBN 978-1-138-63838-9. ^ "Amelie and the Blind Man" (Video). YouTube. Retrieved 24 July 2010. ^ "How Aamir trained for Ghajini". Rediff.com. 15 December 2008. ^ "Ghajini already a hit at ticket counters". Hindustan Times. Archived from the original on 23 February 2015. Retrieved 23 December 2011. ^ a b "Ghajini to fire up screen with 300 paid previews". Economic Times. 23 December 2008. Retrieved 23 December 2011. ^ "Aamir's 'Ghajini' Sold for RS 90 Crore!!". Stardust. Archived from the original on 28 January 2013. Retrieved 23 December 2011. ^ "BIG Pictures goes bigger with 'Ghajini' in the overseas market". Reliance Entertainment. 22 December 2008. Retrieved 23 December 2011. ^ "10 Years of Ghajini: Analyzing the marketing strategy of this blockbuster and also celebrating 10 years of 100 Crore Club!". Bollywood Hungama. 25 December 2018. Retrieved 25 December 2018. ^ "Ghajini's DVD MSRP". Amazon. 29 July 2009. Retrieved 29 July 2009. ^ "Ghajini – The Game". 29 July 2009. Archived from the original on 13 April 2009. Retrieved 29 July 2009. ^ "Ghajini – The Game MSRP". Eros Entertainment. 29 July 2009. Archived from the original on 7 February 2009. Retrieved 29 July 2009. ^ Vicky Nanjappa (1 March 2008). "Ghajini director Murugadoss arrested, released". ^ Sonia Chopra. "Review: Watch Ghajini for the four As". Sify. Retrieved 22 July 2010. ^ Masand, Rajeev (25 December 2008). "Masand's Verdict: Ghajini is dumb and celebrates it". CNN-IBN. Retrieved 22 July 2010. ^ Martin D'Souza (25 December 2008). "Ghajini Movie Review". Bollywood Trade News Network. Retrieved 22 July 2010. ^ Adarsh, Taran (25 December 2008). "Ghajini Review". Bollywood Hungama. Retrieved 22 July 2010. ^ Nikhat Kazmi (24 December 2008). "Ghajini Critic's review". Times of India. Retrieved 22 July 2010. ^ "Review: 'Ghajini' is Aamir's career-best performance!". Zee News. 25 December 2008. Archived from the original on 16 August 2011. Retrieved 22 July 2010. ^ "Ghajini: A sleek album of dark memories". Rediff. 25 December 2008. Retrieved 22 July 2010. ^ Noyon Jyoti Parasara (29 December 2008). "Ghajini-Movie Review". AOL India. Archived from the original on 31 December 2008. Retrieved 23 March 2009. ^ "Review: Ghajini". NDTV. Archived from the original on 28 September 2011. Retrieved 23 September 2011. ^ "Ghajini: It's brutal but almost lyrically so". India Today. Retrieved 23 September 2011. ^ Malini, Gaurav (26 December 2008). "Ghajini: Movie Review". India Times. Retrieved 22 July 2010. ^ Raja Sen (24 December 2008). "Hum Do, Humaare (Memen)to". Rediff. Retrieved 22 July 2010. ^ Shubhra Gupta (25 December 2008). "Ghajini (Movie Review)". Express India. Archived from the original on 29 December 2008. Retrieved 22 July 2010. ^ "Ouch, call ambulance!". Hindustan Times. Archived from the original on 23 October 2012. Retrieved 23 September 2011. ^ Nikhat Kazmi. "Aamir Khan celebrates Ghajini's rock steady collections". Business of Cinema. Retrieved 12 January 2009. ^ "Success Party: 'Ghajini'". Times of India. Retrieved 12 January 2009. ^ "Box office: Aamir's 'Ghajini' grosses RS 900 mn". Business of Cinema. 29 December 2008. ^ Komal Nahta. "Golmaal 3's Record: Highest 1st Week Box-Office After 'Dabangg', '3 Idiots' & 'Ghajini'". Koimoi. Retrieved 28 November 2011. ^ Nikhat Kazmi (12 January 2009). "Box Office: With Rs 200cr in kitty, 'Ghajini' rewrites records". Times of India. Retrieved 12 January 2009. ^ Nikhat Kazmi. "Indian of the Year Entertainment: Aamir Khan". IBNLive. Archived from the original on 29 January 2009. Retrieved 12 January 2009. ^ Nikhat Kazmi. "The Cast And Crew of Ghajini Celebrate The Film's 200 Crores Collections Worldwide". Bollywood Hungama. Retrieved 12 January 2009. ^ "The 100-crore Club". The Times of India. 18 January 2009. ^ a b "The other Khan: A marketing genius". Business Today. 21 February 2010. ^ a b Sen, Raja (25 November 2008). "Rahman goes gloriously wild with Ghajini". Rediff.com. Retrieved 24 December 2008. ^ a b Tuteja, Joginder (24 November 2008). "Ghajini music review". Bollywood Hungama. Retrieved 24 December 2008.